This year, I decided to do a little expirement with my 'Matrona' sedum. 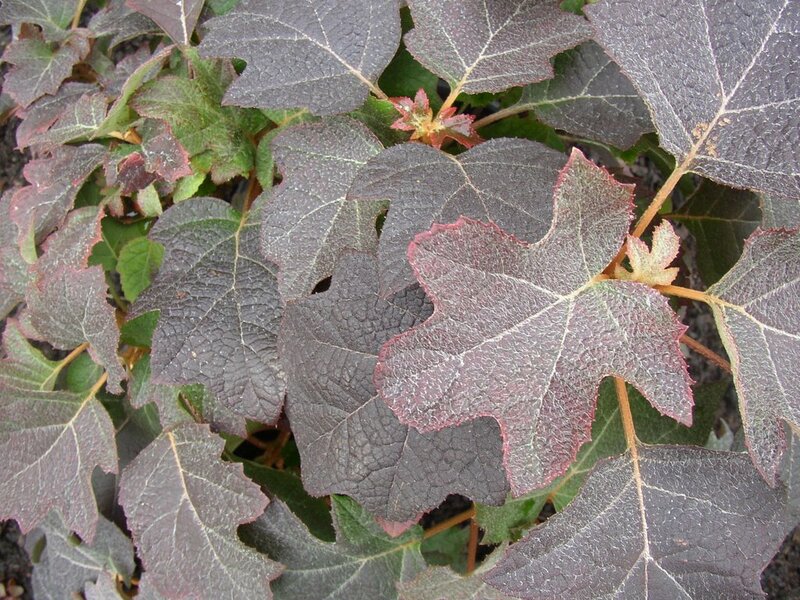 I don't particularly like the bloom on them--I fail to work pink into my garden very well--but I love the foliage. I wondered if delaying bloom until a time when little else was flowering in the garden would make me like them more. Since I have two of them, I decided to let one grow without intervention and pinch back the other continually through the spring and early summer. 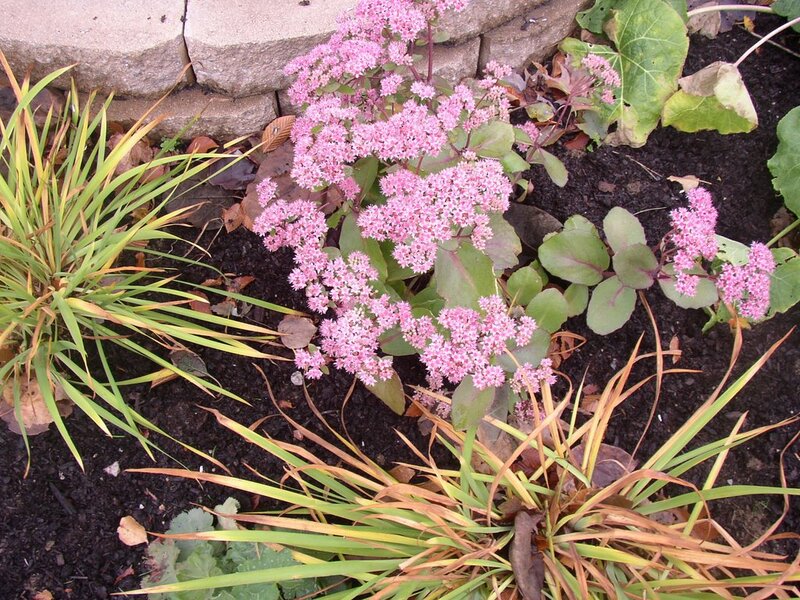 The first picture shows the unpinched sedum, which is now beyond its disgustingly cheerful pink stage and into the dark pinky-brown shades that I much prefer. The second picture was also taken last week and shows the 'Matrona' that I pinched through early August. It's blooming right now, and I am happy to have something else blooming in the yard for the last of the bees to enjoy... so I guess that my experiment was a success in that regard. 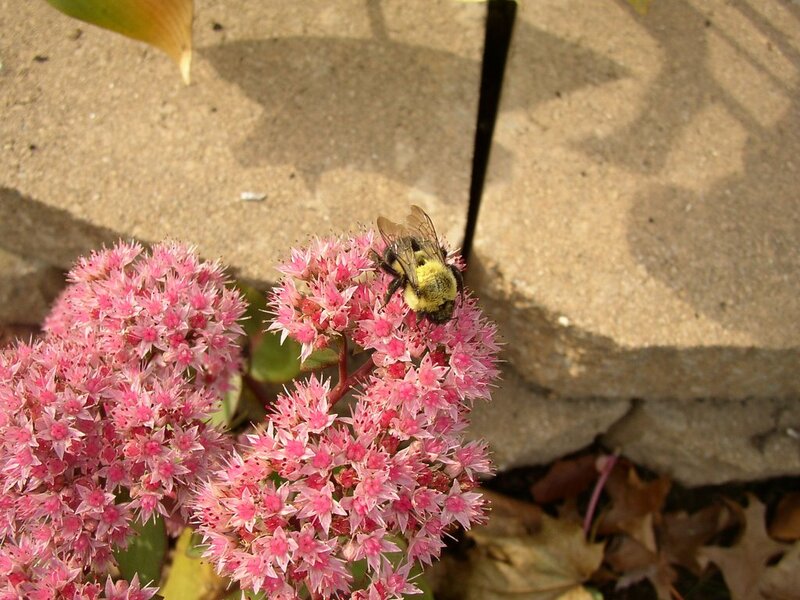 Instead of turning up my nose at the sedum, I smile as I check it for bees. The last picture shows why, bees or no, I will not be pinching my sedums quite so far into the summer this year... unless I move them. Their pink looks a little insipid against the fall colors of yellowing iris foliage. 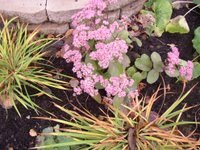 I was planning to keep this sedum here, but if I suppress its bloom until later in the season I risk having to look at a pink and yellow clash made all the worse by the rich fall colors around them. Yikes! 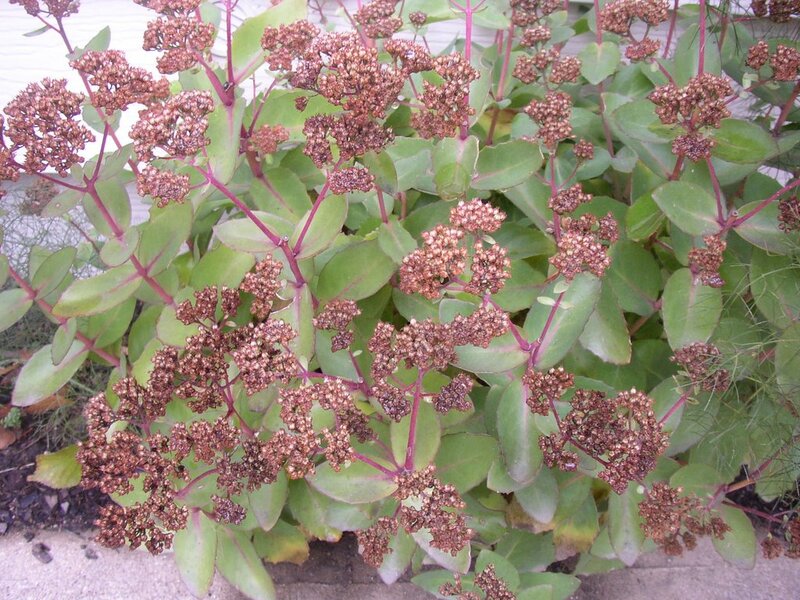 Maybe siting it nearer to a dark purple, burgundy or red foliage may suit the sedum's autumn show a little better. 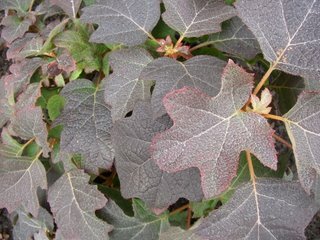 Near the oakleaf hydrangea? Closer to the doublefile viburnum? At this point in the season, I have several months to decide where its next "new home" will be... and that's good, because I tend to change my mind several times before giving anything a permanent home. 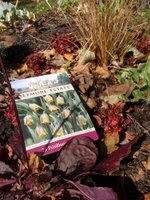 After reading about the "Perfect Fall Days" that so many other garden bloggers have enjoyed recently... I finally got one myself! It's around 50 degrees with just a little wind and lots of sunshine here today. The sky is a bright pale blue befitting autumn in Ohio, and the crisp earthiness of fallen leaves scents the air. I couldn't take advantage of the glorious weather quite as much as I wanted, though. I have lasagna beds to put down and mulch to sling, but I sprained my ankle Monday playing in an upper intermediate volleyball league. (Coming down from a block and discovering your teammate's foot underneath yours is never a good thing.) I'm usually not very good about taking care of my injuries--stubborn, and all that--but I also had spring bulbs to plant in the front beds, so that helped keep me from getting into too much trouble. I planted about 25 small frittilaries, most of them around 'Bressingham Ruby' bergenias and 'Purple Knockout' salvia lyratas to help them show up in the spring. 36 'White Emporer' tulips, 18 'Princess Irene' and 'Avignon' orange tulips, and 8 double black 'Hero' tulips rounded out my planting. The black tulips were hard to site, as I wanted them to have light-colored foliage around them as foils. However, I found that the golden sages, golden oreganos, and variegated lemon thymes were almost too close to the edges of the beds to help much. The white tulips were a little easier to place. They are early tulips and I used about half of them around the area that the crambe maritima (sea kale) takes up in the front bed. The crambe is slow to show up in the spring, so by the time it pushes its dark, alien-like sprouts up and out of the ground the White Emporers will be dying back. My garden assistant merely supervised while I worked, as bulb planting is a little beyond her abilities. 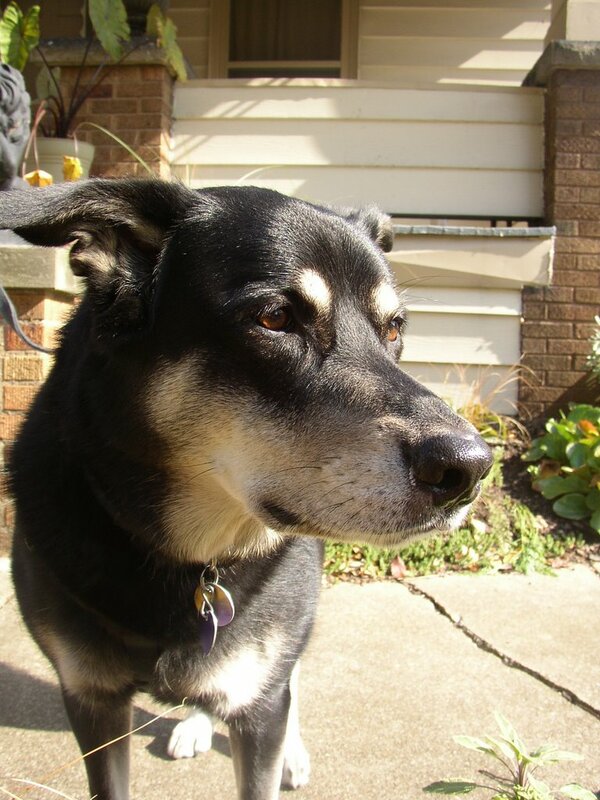 She used to dig some when she was a puppy--and I set aside a special area for that at the old house to keep both of us happy--but at the ripe old age of 5-1/2 she seems to think that getting dirt under her fingernails is beneath her. Coco is very good, however, at a variety of gardening tasks. 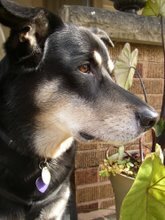 She chases pests (squirrels and chipmunks) out of the yard regularly. She prunes, but only selectively and with questionable aesthetics... for example, she seems to think that lemongrass looks best at 6-8 inches in height. Where she really, um, helps me out is in the harvesting. During our first two years together, she picked and ate the first few ripe tomatoes out of the veggie garden--wasn't that nice of her, to let me know they were ready to eat? 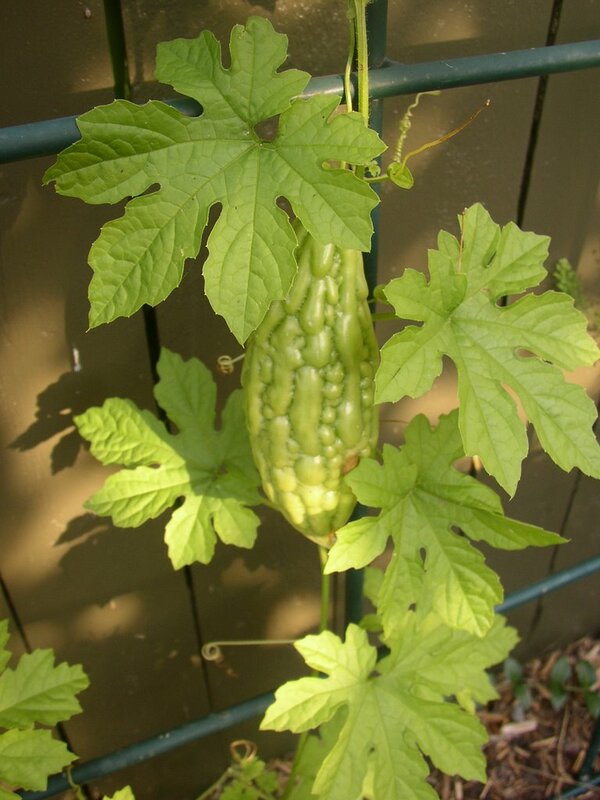 My ex-husband laughed in the spring of year 3 when I announced that she was banned from the back yard until further notice while my first 'Early Girl' finished ripening. I really don't mind when she eats tomatoes out of the garden, I just prefer that the "head gardener" gets the first one! It was especially nice to be able to spend the afternoon in the yard, and with the dog, because I'll be away from both for the next four days. I'm going to New Jersey to meet my boyfriend's extended family and see the town where he grew up. No time to see Old Roses' favorite public gardens at Rutgers while I'm in NJ, or even take a trip to the Brooklyn Botanic Gardens that Xris showed off earlier this summer at Flatbush Gardener when their corpse flower bloomed--sadly, it will be too short of a trip. I am going to bring my digital camera, though, and might have something interesting to blog when I return. Brian wants to show me one of his favorite spots in the nearby Allamuchy State Forest if my ankle feels good enough to allow me to walk there... and you never know what beauty you might find in a state nicknamed The Garden State! I took this picture of my first Sweet Autumn Clematis (clematis ternifolia) blooms last week. 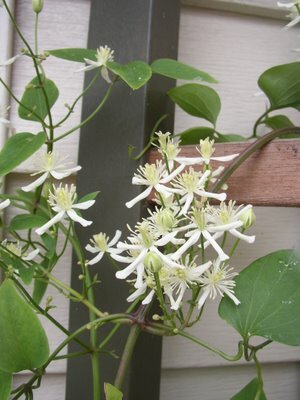 I would like to say that planting it was an honest mistake, but I really should have known that the "white flowering clematis" I purchased at a local nursery last fall would turn out to be SAC instead of the native clematis virginiana, a.k.a. virgin's bower, that I wanted. The white flowers are delicately pretty on both plants, but a little research would have told me that the smooth leaves were a dead giveaway that it was the non-native SAC. Due diligence on plant purchases is usually part of my whole process, but I failed on this one... seduced, I am shamed to admit, by end-of-season sales. For the record, I am not a "natives only" militant but I like to use natives whenever I can. I will gladly use non-natives, however, if they are well suited to the site, fit my purpose, and are well-behaved. That last point is where the SAC seems to fail. My online research points to clematis ternifolia being more prone to escaping the garden and invading natural areas in zones warmer than mine, but it has been known to escape. It is also known for being rather aggressive--some prefer the terms "robust" or "strong grower"--even when it stays in its general area. In fact, I could not find a consensus on which thug designation (aggressive, invasive, etc.) should be given to the Sweet Autumn Clematis, if it even deserves one at all. All of this grey area gave me a perfect excuse to keep it around--for a little while longer, at least--and I really considered leaving it alone. However, I found myself avoiding that corner of the garden so that I didn't have to feel the twinge of guilt that seeing the plant created in my stomach. It simply had to go. Sounds a little melodramatic, I know... and I would never advise someone who had Sweet Autumn Clematis growing in their own garden to rip it out immediately, or even lecture them on its pros and cons. (Purple Loosestrife might be another story!) But I think that every gardener has his or her own comfort level on the issue of invasive plants, and I have discovered that I personally am not very tolerant of even possible problem children. I'm going to sound a little Pollyannaish, I'm afraid, but I like to focus on the positive. I can't singlehandedly pull up all of the garlic mustard, purple loosestrife, and other plants listed on Ohio's Top Ten Invasives list. 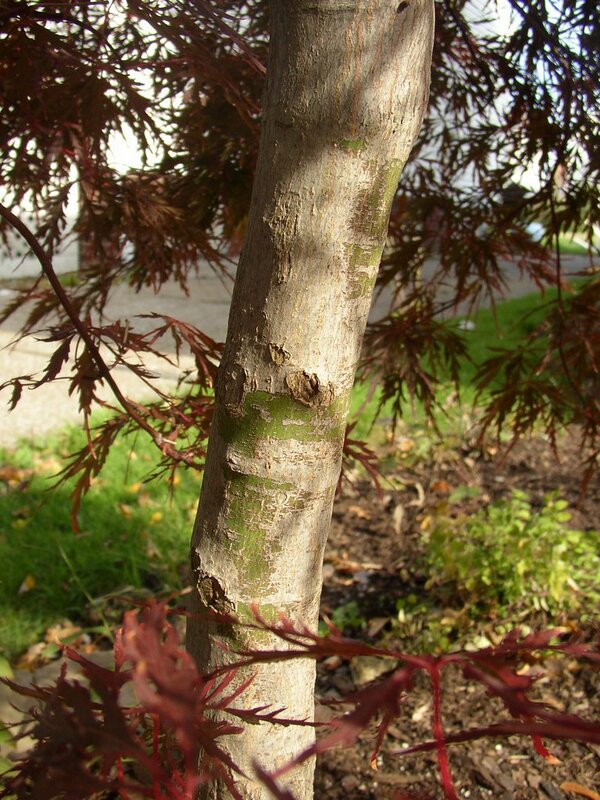 I can't capture and kill all of the Japanese beetles, Emerald Ash Borers, and other introduced pests, either. 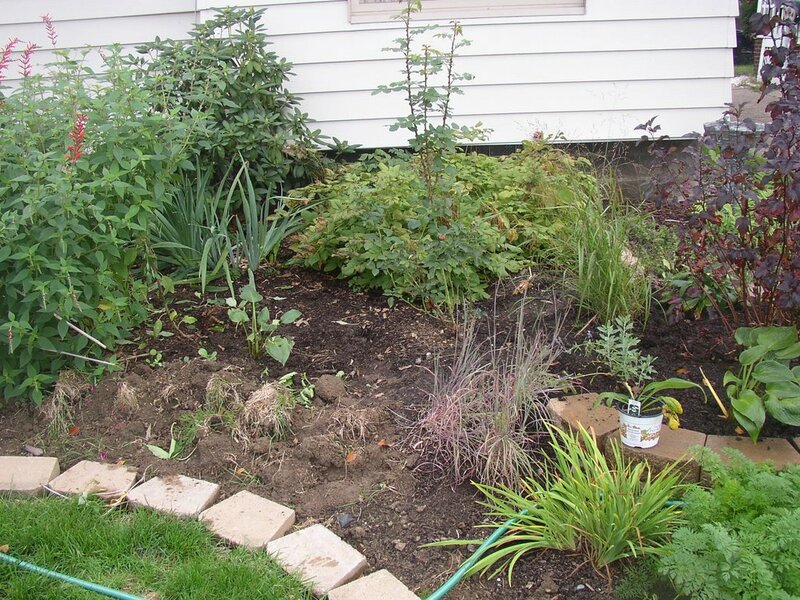 What I can do, though, is pull out a vine that may be a problem, and replace it with a better-behaved native plant that won't give me a guilt complex. I am leaning toward lonicera sempervirens 'Blanche Sandman'--a native trumpet honeysuckle with showy red and yellow flowers. I noticed this afternoon that there were birds enjoying the seeds of the amaranth that still hangs behind the Japanese lantern. 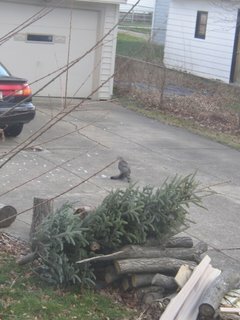 Watching them reminded me that it was high time I put out my bird feeder--a humble cedar affair with plexiglass sides. I thought it might take the birds a day or two to find me, but food has been getting scarce now and it's cold outside. Slushy snow is falling, and the wind is blowing, too... and just 15 minutes later, I had lots of "customers." In fact, word got around very quickly that a new kitchen was open, and squabbles were beginning in the lunch line. So I grabbed an empty quart container and filled it with seed, then scattered it across the driveway near the feeder to avoid further hostility. Most of my feeder visitors are house sparrows, like the little guy you see to the right of the flaming red blueberry foliage in the first shot, but I also regularly see cardinals, blue jays, squirrels, mourning doves (I adore their song), chipmunks, and other sparrows and wrens. I rarely have to deal with the common "feeder thugs," because I don't put out suet--which appears to be the cuisine of choice for common grackles--and mostly provide only black oil sunflowers. Sometimes I get really lucky... and my bird feeder attracts other creatures not for the seed but for those feeding on it. I know a few bird enthusiasts who get downright upset when the hawks and falcons visit their backyards to dine on smaller birds, for me it's a thrill to see these strong, beautiful creatures. 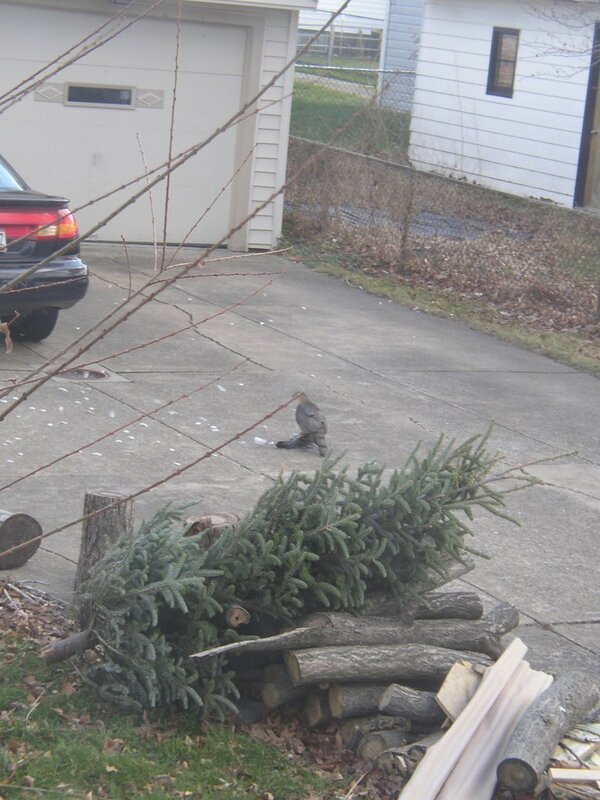 Here's a hawk who had just snagged dinner in my driveway last February. You can click on it to enlarge--she is quite impressive, especially when you realize that bird beneath her is a relatively large pigeon instead of a small wren or sparrow. One other thing that I was happy to notice today is that the birds are using the rhododendron, the purple ninebark, and even "Brian's rosebush" as landing spots. So many of them loved to use the willow tree that I wrestled out of its home this fall that I was afraid they wouldn't have any good landing spots in the garden this winter. 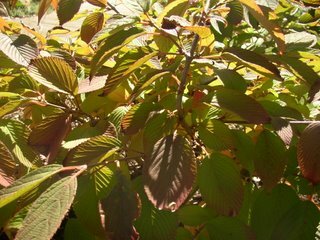 It will be better for them once the ninebark grows larger, but I'm glad to see that they are making due in the meantime. It's getting down into the 30s overnight again this week, but there is still a lot of color in my garden. My 'Vodka' wax begonias are still going strong, as are the tiny blue flowers of the borage. A handful of nasturtiums, pathetically down to just a set or two of leaves, are still sporting multiple bright red flowers. 'Paprika' yarrow is blooming, and so is one of my two 'Matrona' sedums. 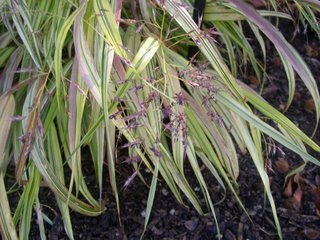 Grasses are flaunting a range of color from buff to dark red, and the spears of Siberian iris foliage are turning bright yellow. Most of fall's color seems to be warm and tonal, but there are a few more energetic combinations in my yard as well. The 'Flashback' mixed calendula that I whacked back to one set of leaves in early September is adding apricot and bright orange shades to an area of garden that also sports the bright red foliage of fall blueberry bushes and 'Dragon's Blood' sedum, bright silver 'Newe Ya'ar' salvia, and the bold 'Rhubard' chard. 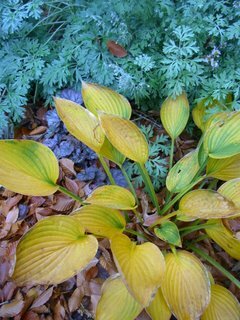 On the other end of the hot/cold color spectrum, electric-yellow tones of an unnamed hosta provide a shocking contrast to the silver foliage of 'Powis Castle' artemisia and the cool purple of the small 'Regina' heuchera. The tan fallen leaves of the neighbor's beech tone down the wattage, but just slightly so. This is not a combination that I would want to see in my garden year-round, quite frankly, but at this point in autumn it's knocking me out in a good way! I have never grown garlic, but after tasting some of the scapes in my friend Dave's garden this summer and realizing just how much garlic I go through in a year, I decided to add it to my own home garden this fall. I try to always purchase my plant material locally... but after seeing the limited choices this spring for things like seed potatoes ("red" or "white") and onion sets ("red," "white" or "yellow") I decided to mail order my garlic. This turned out to be a good idea because the only choice my local garden center offered was: "garlic" They didn't even offer a selection of softneck vs. hardneck, and most disappointing of all was that the people working there weren't even sure which type they were offering. When I was a newbie gardener--before I became conscious of the importance of buying things locally-- I ordered two blueberry bushes and a handful of seed packets from Territorial Seed Company. I haven't ordered from them in a few years because they're on the west coast, but I had been happy with their service and products so I checked out their website to see if they had any good garlic offerings. It didn't take too long for me to be seduced. After some time, I narrowed my choices down to 4 types for this year. 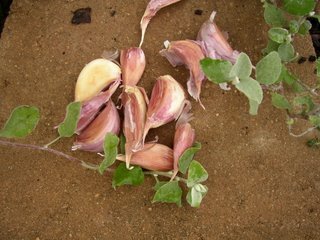 'Chesnok Red' is a hardneck garlic said to be great for baking with a creamy consistency, and as you can see here its cloves are very pretty. 'Purple Glazer' is another streaked hardneck garlic, with "a strong flavor that holds up well to baking" but without heat or aftertaste. 'Siberian' is the last type of hardneck garlic that I purchased from Territorial. It wasn't offered as organic, like those mentioned above, but it intrigued me because it is supposed to have a very high allicin content. Allicin is the chemical in garlic that is credited for maintaining normal cholesterol levels, boosting the immune system, and enhancing circulation. Hardneck garlics are said to have more flavor than softnecks, but hardnecks only keep for several months where softnecks can be stored in a cool, dry place for 6-8 months. Softnecks are good garlics for braiding, too. I ended up adding the organic 'Polish Softneck' to my order so that I could extend my garlic usage through much of next winter. Many softnecks do better in the south than in the north, but this one is supposed to be relatively cold-hardy as well as flavorful. We'll see. I planted my garlics yesterday, and found another benefit to growing your own garlic. Since you're supposed to only plant the best and biggest cloves, you end up with instant gratification because the rest are immediately available for eating! Some 'Siberian' cloves ended up minced into my potato and leek soup yesterday, and I also tasted a couple of cloves out of hand. I am going to do a garlic tasting (raw, and baked) of the cloves I have left, and take notes. Then I will do the same after harvesting the grown garlic next summer. It will be interesting to see how growing through the year in my garden affects the flavor of these garlics... I promise to post reviews, a la Hanna's Tomato Tastings, next summer! I haven't had much time recently to appreciate the little things in the garden. I have been very busy at work, regularly pulling 10+ hour days--even through the weekend--and getting home well after sunset. So in addition to sharing some interesting "inflorescences" (and having an excuse to use the word, which is fun to say) I'm also posting these pictures in order to remind myself that there is fall beauty left in my yard to appreciate. I plan to make time to enjoy some of it this weekend. Last year, I worked part time at a small local garden center. It was a fun place, with some interesting shrubs, native perennials and unique veggies amongst the more usual garden center suspects. People who wanted to know only where the black-eyed susans were--as well as those who sniffed their noses at those requesting such plebeian fare--were equally comfortable there. One late spring day an older Asian woman came in and started asking questions of a young high schooler who had been hired mostly just to water plants. The poor girl looked thoroughly confused, and the older woman seemed to be getting agitated, so I casually walked by to see if I could help. It took me a while to figure out what she wanted... but eventually I caught the words "bitter melon" and understood that she was looking for a vegetable she had purchased there the year before. I took her in to look at our supplier lists, as we frequently would add specialty plants to our orders at a customer's request... but unfortunately they were not available from the grower. In spite of a few language barriers, she and I had a wonderful conversation about the bitter melon. It seemed to be an heirloom type vegetable and she assured me that it was commonly used in Asian cuisines. My curiosity was aroused enough that I decided to look into it sometime... but I admit that by the time I left, the words "bitter melon" had left my head entirely. 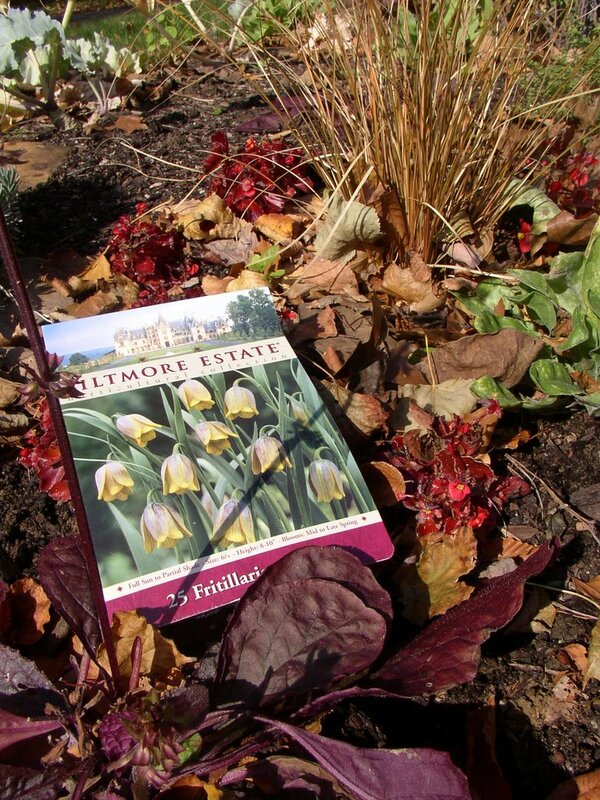 This spring, my friend Pete called me to ask about spring bulbs and the best time to plant annuals. Pete's family owns a wonderful restaurant that serves both Chinese and Vietnamese dishes (and a whole steamed fish that's to die for) and we ended up talking about food and growing our own vegetables. Suddenly, my conversation with the older woman popped back into my head. "Hey Pete, last year there was this woman who came into the garden center looking for a certain Asian vegetable... I can't remember what it was called, but she said it was really bitter..."
Turns out that Pete's Mom grows it every year, but they call it bitter gourd. 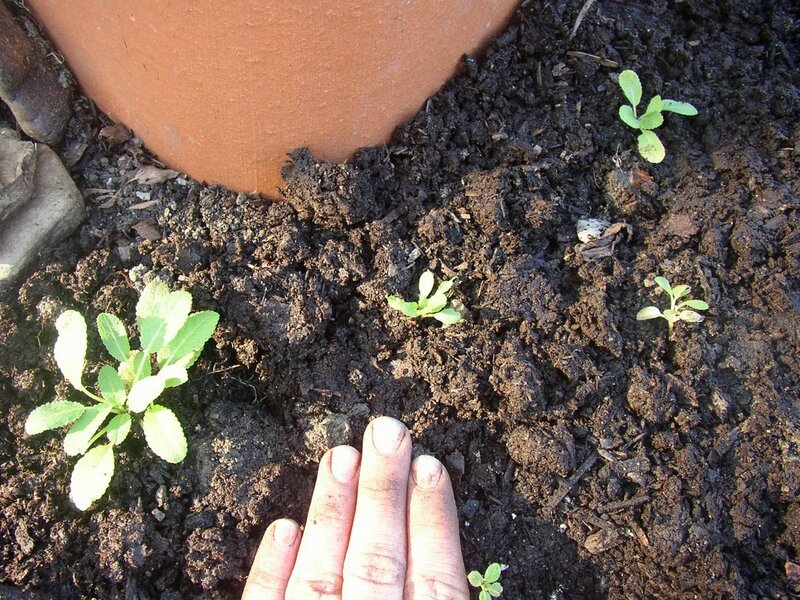 He promised me seeds but did one better by bringing over tiny seedlings in the early summer. Unfortunately the seeds had been started a little late because of our cool spring--and I didn't get them into the ground early enough, either. I ended up with just one bitter melon on my vines, but I did get to enjoy the gorgeous leaves and fairly neat growing habit of the plant itself. 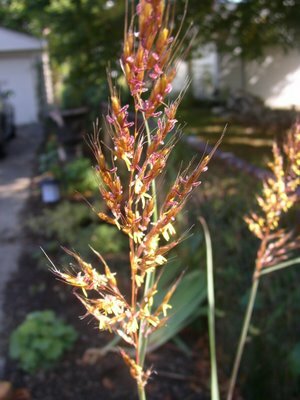 Pete offered me seeds again next year, but I decided to just let this one go to seed and try it myself. 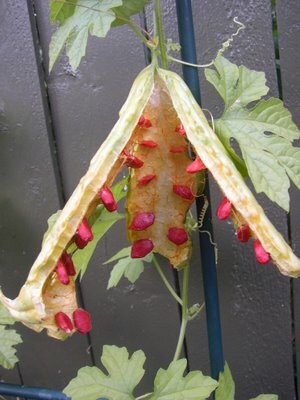 The seeds are a gorgeous red, and almost dry. When the fruit first split open they looked like huge, sticky pomegranate seeds. Pete says to leave them for a bit yet, but that they're almost ready to harvest. If you go online and google bitter melon, you'll find a bunch of references to its supposedly "miraculous" medicinal properties. One site says that eating raw bitter melon every day can cure you of diabetes. Another touts it in pill form. Maybe they operate on the assumption that something so bitter and difficult to eat MUST be good for you?! My friend Dave is a great guy... and he and his wife Wendy have a beautiful garden. Dave doesn't mind when I pick his brain about how to grow something new to me, or when I lecture him about growing roses organically. 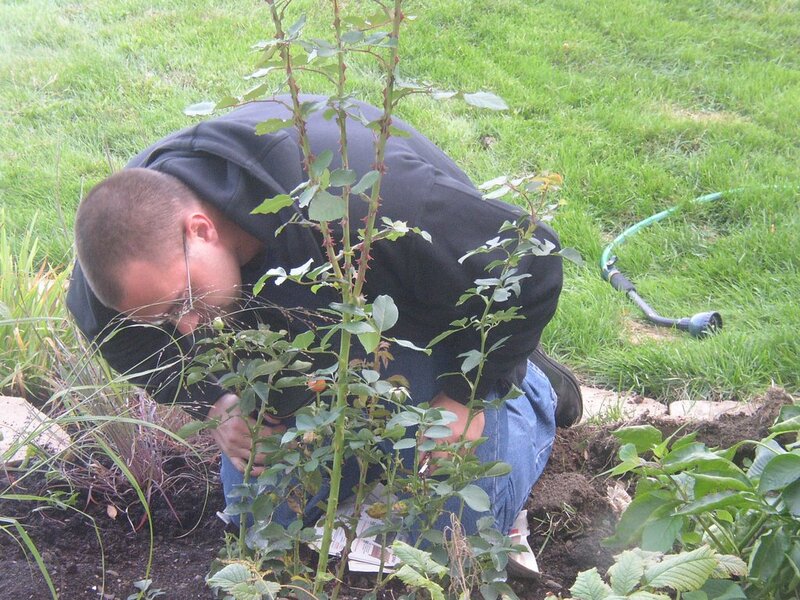 (Outside of rose spraying, he's an organic gardener.) When I think of Dave, I think of a beautiful, generous spirit. He's the kind of person that you can't help but smile at, even on a bad day. I'm a gardening infant in comparison to Dave, and I fear that our relationship hasn't been much of an even exchange. Because of that, I was excited when he seemed so delighted at my offer of a hydrangea a few weeks ago. He had killed one off early in his long gardening career and never got around to putting another one in... and I had one that just wasn't happy in my sandy, dry soil and wasn't about to be coddled by me. It needed a better home. I dropped it off after work on Monday, and couldn't help turning a little green with envy at all of the color Dave and Wendy still have in their garden. 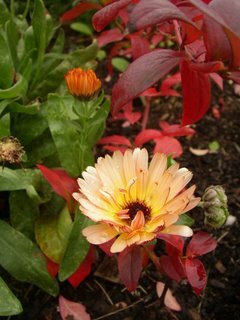 They grow marigolds, zinnias and dahlias throughout their veggie garden so that these annuals can take over once the produce is done. All that color is so dazzling in the fall that you don't even notice the bare ground where tomatoes once sprawled. True to form, Dave wouldn't let me leave without filling my giant container in turn. When I protested that I didn't want to raid his flower garden, he observed that they would all die in the temperatures predicted for the end of this week anyway and kept cutting. When I commented that I didn't have enough vases for all of them, he said that water glasses would do just fine and kept cutting. When I asked if he and Wendy had enough flowers for bouquets of their own he said that their house was full, they had sent loads of flowers home with their kids and grandkids over the weekend, and there were still plenty more in the garden. And he kept cutting. I wanted to be both grateful and gracious, so I decided to stop protesting and enjoy what he was so happy to share. 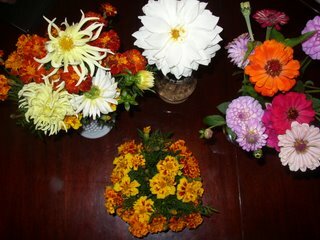 I ended up getting 4 arrangements out of the cuttings: a crystal bowl full of marigolds cut short and packed tightly, a milkglass pitcher with yellow dahlias and red marigolds (my favorite of the 4, which you see above), a huge white dahlia in its own antique bottle, and a plain glass vase full of bright zinnias and lavender dahlias. The flowers will probably last for a week or so in their vases, but the beauty and generosity of the gardener will stay with me for a lot longer. 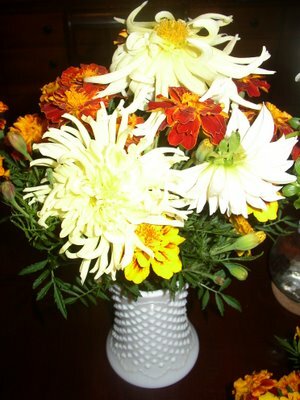 As I arranged, I had visions of surprising coworkers, friends, and favorite neighbors with bouquets next summer. I want to be as abundant and generous in my gardening as my friend Dave. I think that I can get there someday--it just may take me a little bit of work. Dave, on the other hand, makes it look so effortless. Do I Have Baby Salvias? I was dismantling my large containers today when I came upon a few surprises. Six surprises, to be exact. 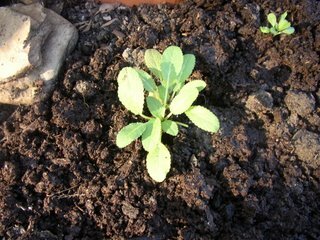 In two of the three pots where I had temporarily tucked some 'Caradonna' salvia, I found these tiny seedlings that looked like baby sages. One of them was large enough that I was comfortable breaking off a leaf and sure enough it smells a bit like meadow sage, too--just a lighter scent than my larger plants give off. I'm kind of confused about all of this... how does this happen? The 'Caradonna' salvias were just babies (tiny little plants from Bluestone) and to my knowledge they haven't flowered for me yet. Could these things have sprouted from some of the roots that were left in the pot when I unceremoniously yanked the plants out to put them in the ground? Or am I being fooled by a clever weed that just happens to look like baby sage and was growing in the right place? I planted all of the tiny seedlings in my garden beds, but I have no idea if these little guys will overwinter since they're so tiny. Anyone have advice on how to give them a good chance--or do you think I should bring them inside for the winter instead of leaving them out? I would appreciate any thoughts on this... I would love to have more salvias, whether they are true 'Caradonna' babies or some unnamed hybrid between my 'Caradonna' and my 'May Night'! Full moons are associated with insanity, hence the terms "lunatic" and "lunacy." The October full moon can be the Hunter's Moon (Native American), Harvest Moon (English), Travel Moon, Dying Grass Moon, or Blood Moon. The grass that you see in this picture--which I took in the light of the full moon, assisted by porch lights-- is indeed turning brown at the tips, so "Dying Grass Moon" may well be appropriate. But the real insanity is that my 'Paprika' yarrow is blooming right now. I bought three of these from Bluestone Perennials this spring, and the other two had a bloom each this summer during the time when the achilleas normally flower. Apparently it took the wackiness of a full moon to coax blooms from #3, which you can see in front of the ornamental grass. 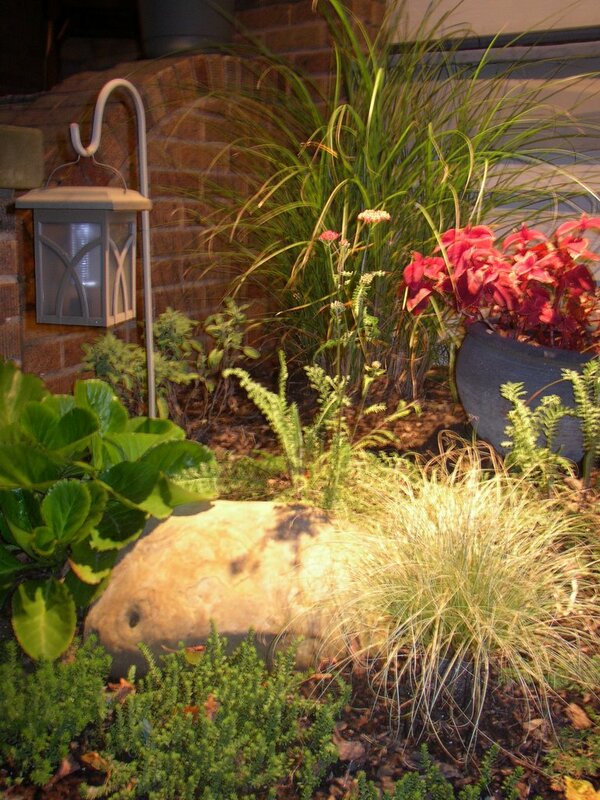 The other plants in this vignette are: red coleus, in the grey pot, more achillea 'Paprika' foliage, a carex comans 'Frosted Curls' that will be moved in the spring to a moister locale, 'Chubby Fingers' creeping sedum, 'Bressingham Ruby' bergenia, and a small golden culinary sage. Cal Ripken played his last game exactly 5 years ago today, on October 6, 2001. He won so many awards--MVPs, Gold Gloves, Silver Sluggers--that it would take a whole post on a separate baseball blog to talk about them. I was thinking about Cal today as I checked out my 'May Night' salvia. Cal is, of course, best known as baseball's "Iron Man" for playing in 2,632 straight games over 16 consecutive seasons. 'May Night' is known as a garden workhorse for its consecutive weeks in bloom... and it has been blooming in my garden now since the first week of June. I sometimes remember to deadhead it, and sometimes not. Doesn't seem to matter either way--'May Night' is still flashing its baby blues well into the fall with nary a complaint. Rather like a certain #8. The Year of the Spider? The storm window was removed in early June so that I could repaint the window sill. I stripped off the old cracked paint, primed, and got two coats of the dark brown paint on before we hit a rainy spell. The only steps left were to clean the paint spatters (some from me, some from previous owners) off of the glass with a straight razor and then carefully add a final coat of brown. By the time I got back up on my ladder a week later, the spider had moved in. I didn't think that he was going to catch much up in that high window--it's a good 10ft. off of the ground--so I decided to finish off the other two and then come back to this one when he'd left for buggier pastures. I'm still waiting for him to leave, in fact... but at this point it seems as though he's got a lease through the first frost. 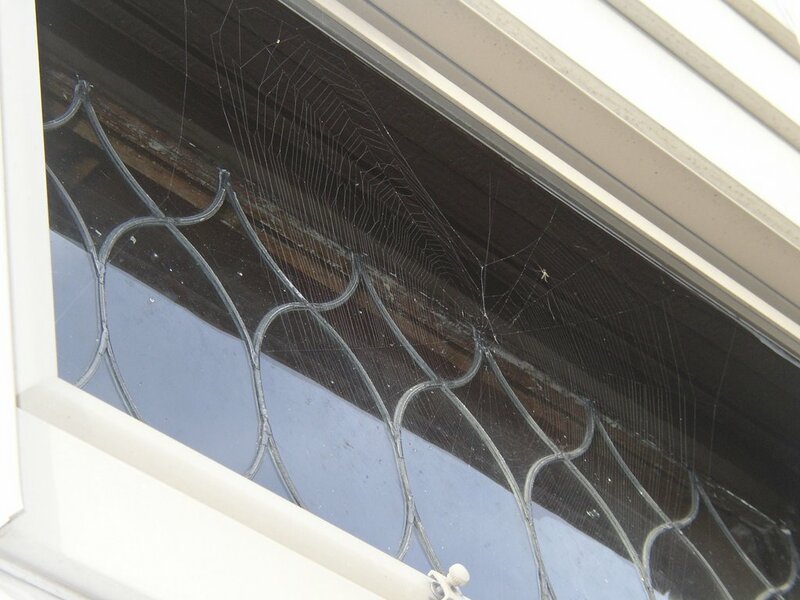 He travels the web during the evenings, but during the day he crawls up to the top of the web and hangs out on a little spider-sized "shelf" that the inside of the storm window provides. I like to stand on my stair landing, just inside the window, and check on him as he naps the day away--he looks so snug and comfortable there. I haven't been able to get a good picture of him, though, because he's very camera shy and the old glass is uneven enough that it distorts anything I try to take from the inside. So I'll just enjoy my temporary pet spider until it gets too cold for him... and postpone my plans to finish that window until next spring. Okay, maybe it didn't. But I definitely felt like I was possessed as I tore through the back bed last night. I didn't plan to start ripping the bed apart at all--I just kind of snapped as I was looking at it. 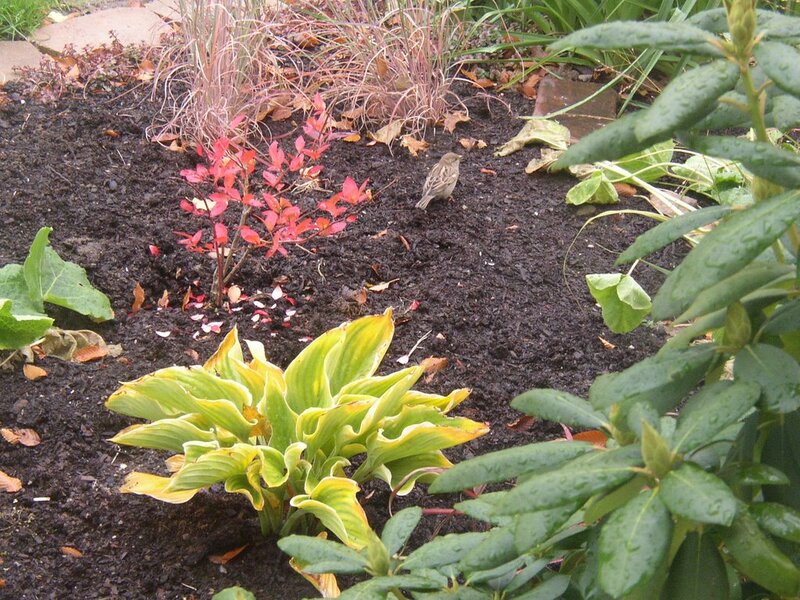 See, the area where I put in the purple ninebark a week or so ago is starting to look good already. In front of it, the 'Little Spire' Russian sage has rebound once it escaped the shade of the amaranths that had towered above it. I threw an unnamed hosta in the open space beside the perovskia until I can figure out what dark-green-leaf plant I want there permanently. I kind of like the play between those three things and the still-small 'Rotstrahlbusch' panicum virgatum to the left. In fact, the more I looked at the area I liked, the more the rest of the bed just started to eat at me. 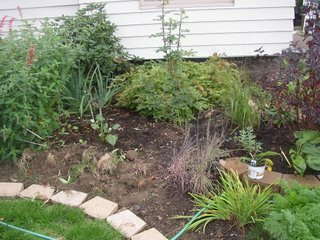 There were so many things in temporary places--like the little bluestem, which clashes with the Russian sage--and so much unevenness. I tried to mentally move things so I'd have a plan for the spring, but even that wasn't helping... I finally couldn't stand it anymore and went to grab the shovel. The picture above was taken midway through the carnage. I had hacked out one of the pineapple sages, dug out many tall iris, and transplanted a hollyhock that I'd started from seed. The rest of the pineapple sage, all of the other annuals, and the carrots would also come out before the sun went down, and I'm finally down to mere perennials and shrubs in that bed. So it looks absolutely terrible now, but I can finally see what I'm working with and start moving plants accordingly. Out of chaos will come better order, but I must admit that I'm still a little stunned by all of the demo work that I accomplished yesterday. Does anyone else have, um, "episodes" like this in the garden? Or am I alone in my pseudo-artistic temper tantrums? 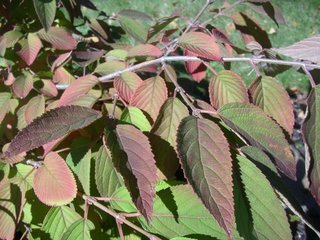 As I worked in the garden for a while today, the changing colors of the doublefile viburnum kept catching my eye. 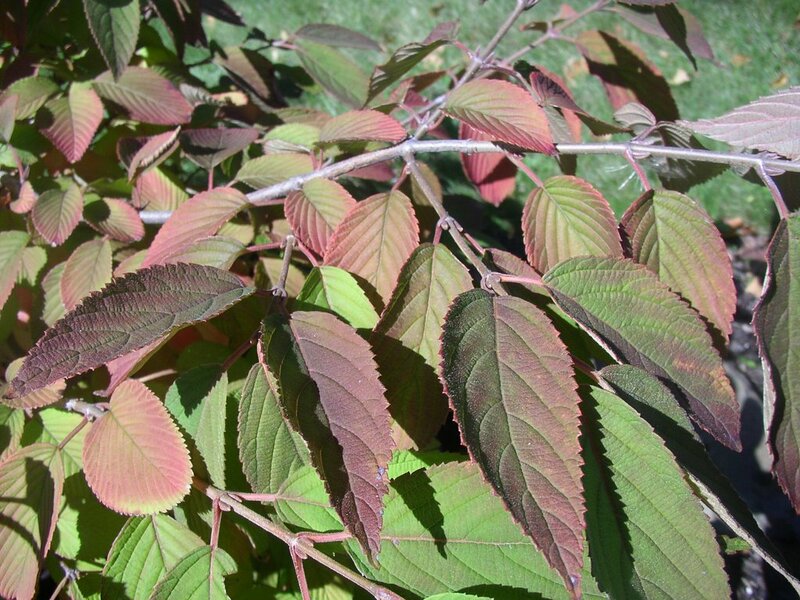 I love this shrub in all of its incarnations... when it holds its delicate spring flower sprays lofted, when its thickly serrated green leaves sway in the summer breeze, when it starts to turn a dark reddish purple in the fall, and when its horizontal branches catch dustings of snow in the winter. 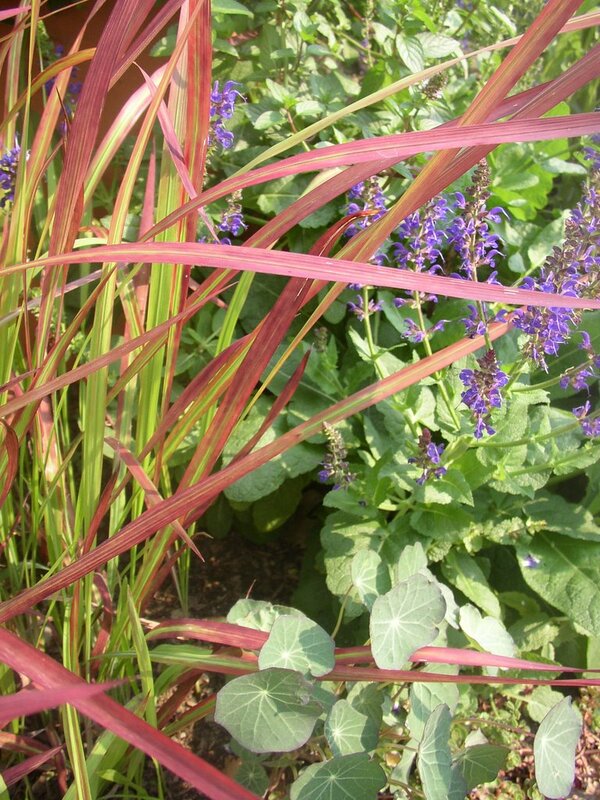 The jewel-like reds and purples were quite dazzling in the sunshine, playing off the deep color of some nearby purple-leaf heucheras and the reddish brown carex buchannii. I took some time out from fall planting and ran inside for the camera. I walked around the shrub from West to East, taking several pictures from different angles before bringing the camera back to safety inside. Tonight, when I went to download the pictures, I was amazed at the difference in the way the shrub looked frontlit vs. backlit. On the first picture, you can tell that the bright sunshine is coming from the front and is washing out the leaf colors a bit. You still do get a sense of the darkness of the reds and the deepening purples, though. 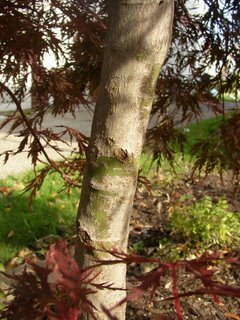 You see the serration on the leaves, the branching structure, and even some grass in the background. On the flip side, you don't catch any of the "glow" that was so enchanting me every time I walked past the shrub. In the second picture, taken within a minute of the first, the shrub is backlit. This is a much more warm and dramatic way to see the colors of the leaves, and you don't have to imagine that the leaves can actually glow. You see it with your own eyes. You still see the serration and a little bit of the background, too. In the interest of truth I must admit that the backlit pictures aren't 100% accurate, either, however. In picture #2 the shrub shows way more orange and yellow tones than I saw in real life. That said, it still seems to capture the spirit of what I was trying to take more so than the first picture does... maybe it just better represents the feelings of wonder and magic with which I tend to view my garden?